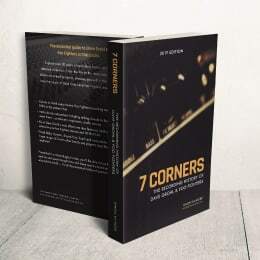 Make no mistake, ‘7 Corners’ is not just another Dave Grohl and Foo Fighters biography. It’s not a book exploring their personal stories, how many records they’ve sold or the general timeline of the band that you’ve heard many times before. This is a unique book focused solely on the music. 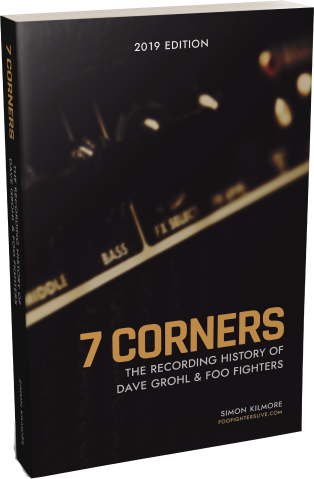 Documenting over 75 different recording sessions spanning 30+ years this book aims to place you in the recording studios and experience what it is like for Dave Grohl, the rest of Foo Fighters and various other musicians to record some of their biggest hits. 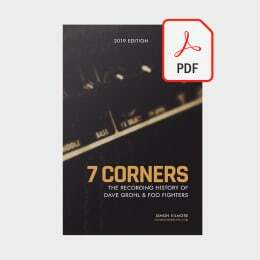 The recording of all nine studio Foo Fighters albums, demo recording, side projects, Dave’s early pre-Nirvana bands, it is all here. Hundreds of hours of research has been conducted in putting together the book including talking to many of the people who were at the sessions. Band members, producers, studio owners, engineers, photographers, they’ve all been approached and have helped contribute first hand information to what is undoubtedly the ultimate collection of information on the recording history of an extraordinary musician and his world beating band. Presented in a chronological order, you’ll be able to live through each session and pass through time with Dave and the band as they record around the world – it’s all documented In this exhaustive collection. 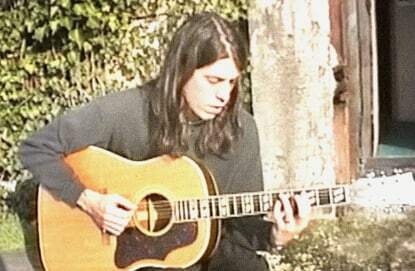 As Dave Grohl bounced around bands in the early 1980s his desires to write his own music grew ever stronger. 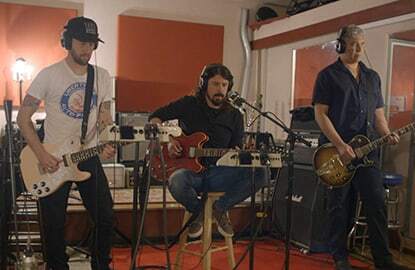 With the incredible ability to competetently play all parts of a song himself, Dave recorded his songs for over a decade, including during his time in NIRVANA. All of these sessions are documented as well as his later solo efforts away from the band, such as 2018’s PLAY project. Born out of the tragedy of Kurt Cobain’s death Foo Fighters have risen from the ranks of tiny clubs playing to a few hundred people to selling out huge stadiums across the world. 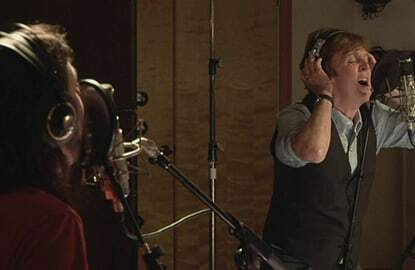 In that time they have recorded nine full length albums and also put to tape many other songs, including contributions to movie soundtracks. Those, as well as demo recording sessions which produced songs never released to this day, are all featured. Ever since his Days in Nirvana Dave Grohl has been a man in demand. Usually for his immense skills behind the drum kit, but in later years he’d also be approached to contribute just about anything. 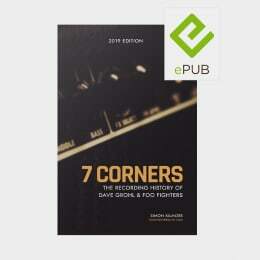 Also featured in the book are details on the bands Dave was in before Nirvana, such as Dain Bramage and Scream. Finally you’ll also find details on some related projects Dave and the band were involved with, such as the Sound City soundtrack. I’ve been a fan of Foo Fighters since the late 90s and my ever growing love of the band led me to create FooFightersLive.com in 2006, a website packed with information on the band including their live performances, their songs, and more. Whilst I’m not a musically gifted person myself I have always had a keen interest in the behind the scenes of any artist, how they made their music, and it was that fascination which led me to start researching Foo Fighters studio history many years ago. I now want to pass that knowledge on to other fans, and try to make sure it is never lost to time. 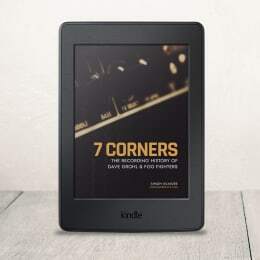 7 Corners is not an official publication by Foo Fighters; it has been created independently and is not endorsed or authorized by the band, it's management or record label in any way.